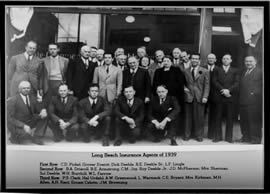 For over 75 years we have been providing quality insurance services to Long Beach and it's surrounding communities. 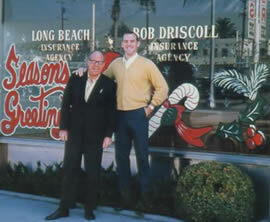 Bob Driscoll founded the agency in 1939 following in his father Louis' footsteps. Bob's son Mike then joined the agency in 1964. Mike, who has recently retired, turned the agency over to a fourth generation Driscoll, his son Kerry who has been with the agency since 1997. The Driscoll name is Irish in origin and was originally O'Driscoll. However, it was changed by our ancestors when they first came to America because there were to many damn Irishmen, so I am told. The translation of O'Driscoll comes from the Gaelic word Oheidersceoil, which means an intermediary. So the family being in the Insurance profession should be of no surprise. Besides being great agents, we were a powerful seafaring clan and great castle builders! So how did we come up with our logo you might be thinking. The logo is actually the modern spelling of Driscoll using the ancient Irish 'ogham' alphabet which first appeared between the 4th and 6th centuries AD. Interestingly enough, this alphabet was written both horizontally and vertically, so it reads properly either way. So there you have it. Probably more then you wanted to know. The question should be “What do we do differently?” From the initial review to enrollment, to your annual check ups, we focus on earning your trust through unparalleled service. We promise to always do our best and assure you efficient, honest and reliable answers to all your insurance needs. We will provide you with a total insurance Protection Package. Your protection and peace of mind is our only business. We believe our customers want service. We believe that our customers want to be insured, not just buy insurance. We believe that protecting your family, business and your future is our job. We want to establish a relationship with you that will last a lifetime. When insuring, protect against the broadest perils possible while retaining as much risk as comfortably affordable. Insuring against catastrophic losses and retaining the risk of “everyday” maintenance losses is the best overall value. We are not a bank! We are not a faceless website address. We are not an out-of-town 1-800 # company taking orders from fifty states. These type of employees answer to supervisors, not to you.